When considering social automation, the first thing to know is how does it compare to PPC (Pay-Per-Click). 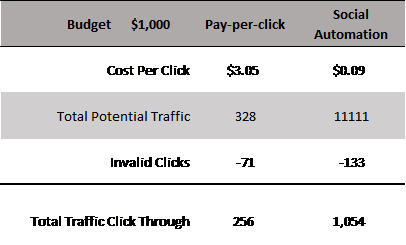 If you know what you spending on PPC it’s easy to compare a simple cost analysis and benefit if you know the value you are receiving from your PPC campaigns. Truth is most campaign managers don’t have a clue because without expensive 3rd party directed synced analytics, that often costs as much as the PPC campaigns themselves, there’s no way to possibly know your ROI. In order to make this post of something useful let’s pretend we know our response numbers – but you don’t need to know them to compare the two, the core purpose of PPC and social automation are virtually identical. The following is a data pool from 100 google AdWord ad network advertisers from a broad random range of markets. AdWords are purchased based on a bid system for the placement of banner and widget content inline with google search results and their affiliate sponsor network. A banner or widget can consist of a small image, a title, a URL link, and a descriptive typically about 20 words. The size of a campaign isn’t significant as the data stacks well in cost trend based on campaign size. The first disturbing PPC trend just off the top is that prices of PPC campaigns almost doubled in 2016 from 2015. What was once just lunch money is now a mortgage payment. This could be a result of a growing economy, more sellers drive up the bids for PPC spots. Conversation rate is difficult to gage due to the varying activities that define a specific advertisers campaign objective. Some advertisers want sales, some want signups, and some want downloads. A conversion is simply an end objective positive result. In 2016 more defined conversion tactics influenced the numbers due to a greater non-agency buyer pool, when you’re spending your own money you tend to be a bit more performance focused. 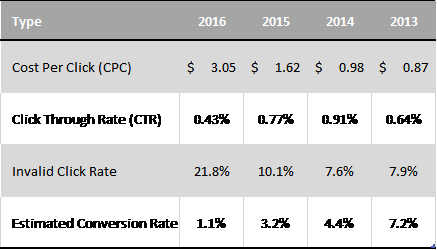 From about 2007 through 2014 there was not much change in CPC this might have been primarily due to a large portion of PPC campaigns that were driven by large buys mostly managed by agency or PPC buyers. In 2015 and 2016 there was a significant increase in non-agency buys. Agency buys in 2014 represented over 40% of the market. In 2015 agency purchases dipped to around 34% of the market share. Why? because agencies charge a management fee and with the increasing costs of PPC combined with agency fees the already unknown ROI becomes significantly further out of reach. Social Engagement, though a similar goal to build online traffic, plays out a little different. Social automation is response engagement based on real-time conversations that take place in many mainstream online social forums such as Facebook, Twitter, and LinkedIn. Until recently social engagement was a manual process that required substantial human sweat equity. 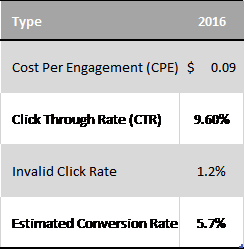 Comparing the two prior to automation wasn’t practical making PPC a substantial financial bargain. What hasn’t changed is the results. Though the human factor makes social media campaigns cost prohibitive the results they produce by activity is significantly better than PPC. Automation is a disruptive industry game changer. When you remove the human cost you can now apply the benefit of social media engagement on a level playing field with PPC services. A single server can post hundreds of engagement responses a minute with precision accuracy across multiple social channels. In 2016 ailign posted hundreds of thousands of automated social engagement responses. Here’s what the numbers look like. Let’s break it down simply by Cost to Conversion. If we have a budget of $1000 on each campaign type respectively. Another dynamic benefit of social automation vs PPC is positioning. Positioning is an essential component of PPC and the primary factor that drives up costs. The entire cost model of PPC is orientated to benefit the highest bidder though ad placement position strategy. 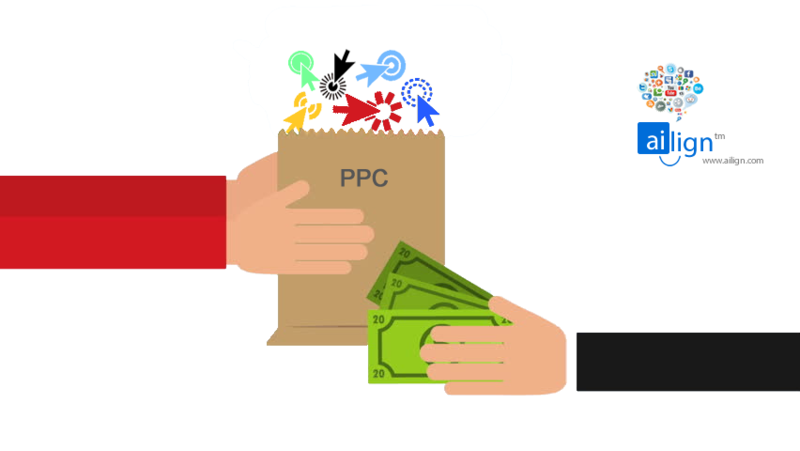 Simply bidding for PPC keywords is no guarantee of placement. Social media is about influence engagement during real time conversations, social automation guarantees your placement regardless of your campaign budget. Pay for a post, it get’s posted! While we’re pouring salt on the PPC wound let’s do one more. Social media has a significantly broader audience than PPC. A social forum post can last days, months, and even years, the lifespan of a PPC is only about 6 seconds. Apply post duration to the numbers above and you could potentially double and/or triple your Total Traffic Click Trough with Social Automation! This entry was posted in Automated Information, Marketing Strategy, Social Media and tagged ailign, PPC, social automation. Bookmark the permalink.